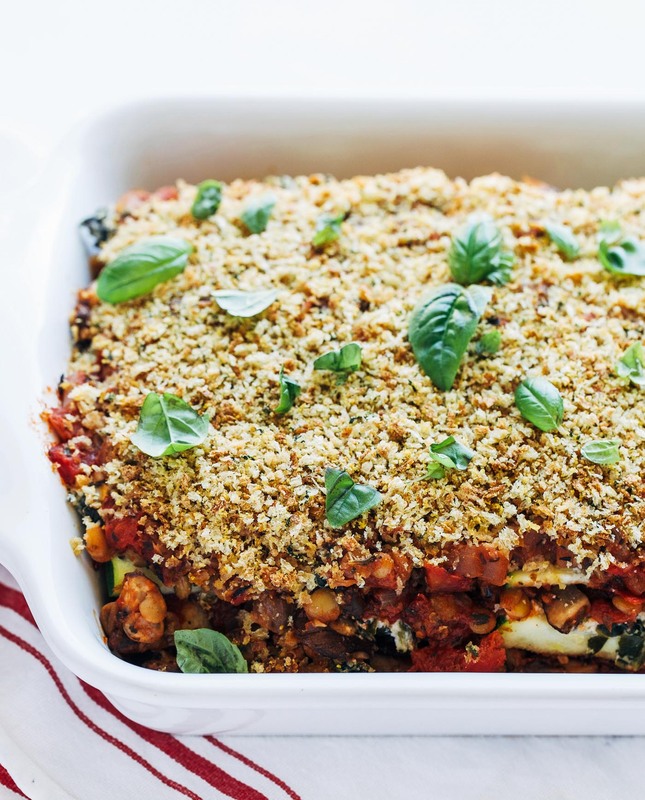 This recipe is based off my Cashew Ricotta and Spinach Stuffed Shells. 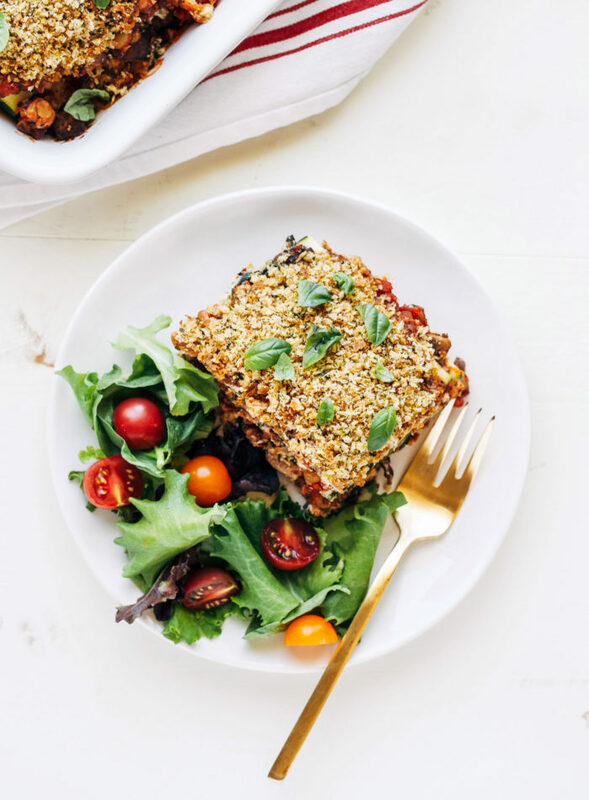 They’re easily one of my favorite recipes on here because: a) they’re so simple to make and b) they’re a prime example of how amazing vegan food can be without the need for any funky ingredients or faux-meat. I knew I wanted to create something else using that incredible cashew ricotta but I have to thank Kelli for inspiring this recipe. She wrote to me after trying my stuffed shells and suggested using the ricotta to make a zucchini lasagna. I loved that idea and immediately added it to my list. In addition to the cashew ricotta, I incorporated the lentil mushroom marinara from my Spaghetti Squash Bowls. It adds more work to the recipe but I promise it’s worth it. Not just for nutrition, but also for flavor. However, you can always substitute your favorite marinara in it’s place. Once you have the ricotta and the marinara made, it comes together super quick. All you have to do is slice the zucchini and layer it in a baking dish. There’s no boiling required! 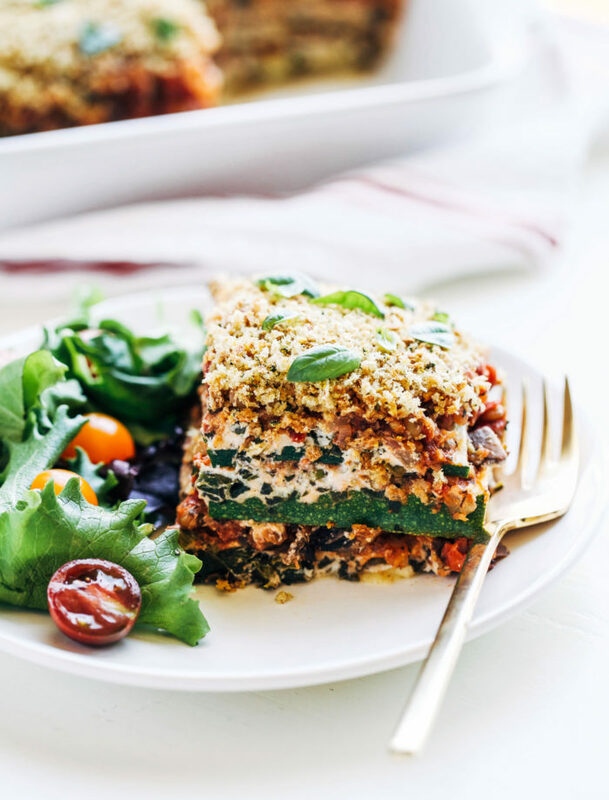 The cashew ricotta gets spread on top of the zucchini then layered with marinara. You repeat that step three times, top with breadcrumbs mixed with nutritional yeast, then cover and bake for 30 minutes. I was worried that it would be really watery or not hold together well but it turned out to be just the opposite. The cashew ricotta does a great job binding everything together and, surprisingly, there’s only a minimal amount of water produced by the zucchini. To make the cashew ricotta: Drain and rinse the soaked cashews then transfer them to a blender or a food processor, along with lemon juice and one teaspoon of salt. Blend on high until smooth with a texture similar to ricotta cheese. You will probably need to use a spatula to scrape down the sides in between blending. Spoon the cashew cheese out into a large bowl and set aside. Once the frozen spinach has defrosted, place it in a strainer. Fold a few paper towels together and use them to press on top of the spinach so that the excess water strains out of the bottom. 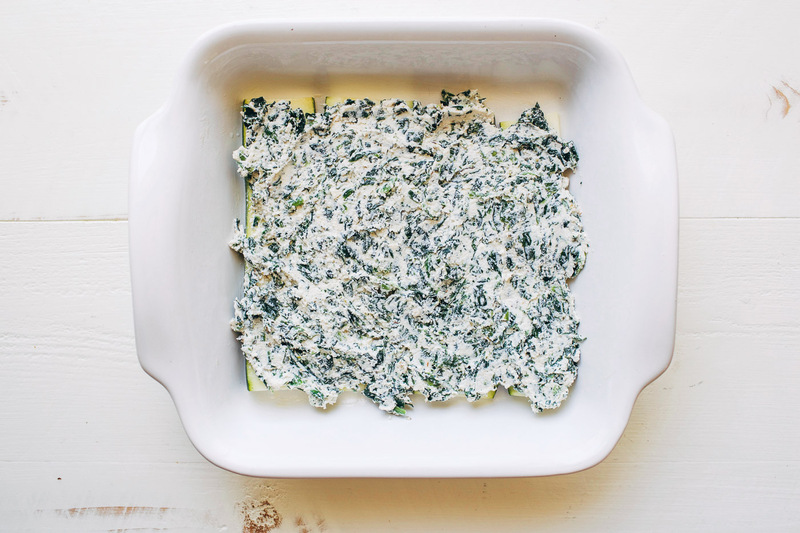 Repeat this step until the spinach is mostly dry. Add it to the bowl with cashew cheese and a dash of salt & pepper then stir everything together until well-combined. To make the lentil mushroom marinara: warm one tablespoon olive oil in a large saucepan/skillet over medium heat. Add the onion and cook for 3 minutes. Add the garlic and the mushrooms, sprinkle with salt & pepper, stir together and cook for another 3 minutes. If you have red wine on hand, pour in 1/4 cup and turn the heat up slightly so that the wine simmers for about 5 minutes. Next add the dried herbs, both cans of tomatoes and their juices and the tomato paste. Cover the pan and continue to simmer for 15 minutes. Then stir in the cooked lentils and simmer for another 10 minutes. Assemble the Lasagna: Preheat the oven to 400°F then lightly grease an 8 x 8″ baking dish. 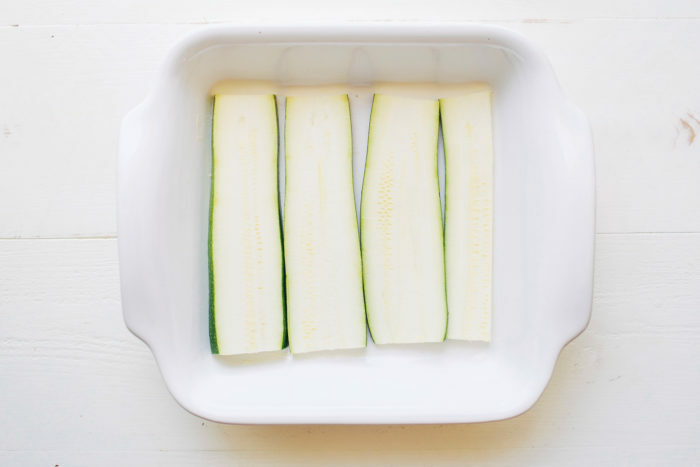 Arrange 4 zucchini slices along the bottom. Depending on the width of your zucchini, you may have to cut one piece in half lengthwise to make them fit. 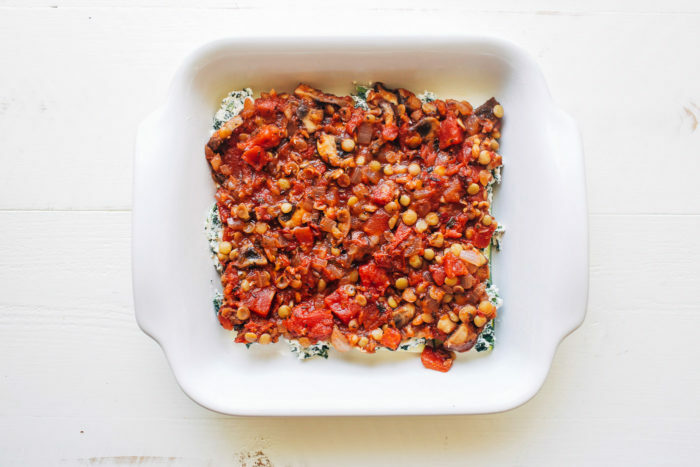 Spread 1/3 of the cashew cheese mixture on top of the zucchini then top with 1/3 of the lentil mushroom marinara. Layer another 4 slices of zucchini on top and repeat the same steps twice more, until you have three layers total. Combine the breadcrumbs and the nutritional yeast in a small bowl. 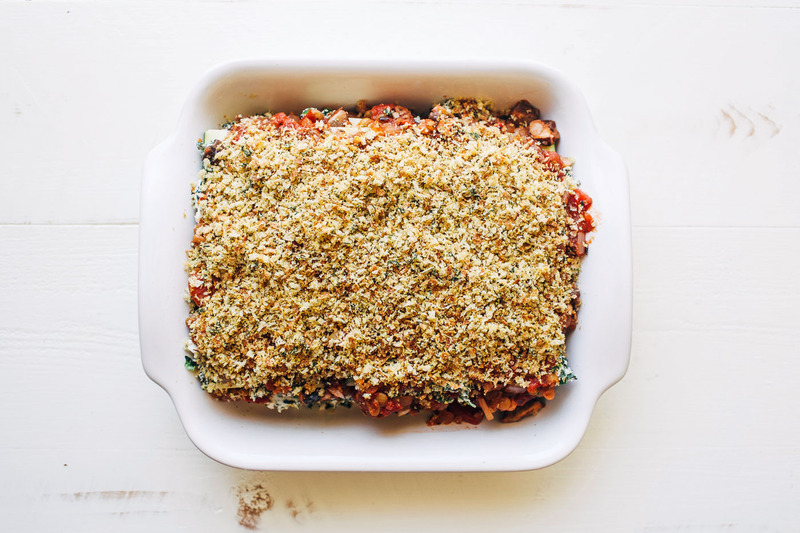 Sprinkle it on top of the lasagna, cover with foil and bake in the oven for 35 minutes. Allow to cool for 5-10 minutes before cutting into separate pieces. Garnish with fresh basil and enjoy! *Place 2 cups raw cashews in a large bowl and cover with water by a few inches. Soak for at least 6 hours or overnight. 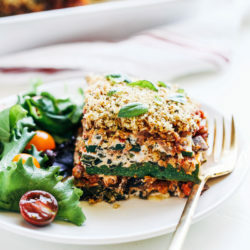 **I prefer to make this with lentil mushroom marinara for extra protein and flavor but feel free to substitute your favorite marinara if you prefer. Depending on how flavorful your sauce is, you may want to add garlic and herbs to the cashew ricotta mixture. Also, please note that the recipe for the lentil mushroom marinara will make more than you need. I like to freeze the leftover sauce to add to pasta or zucchini noodles later on. If you don’t want leftovers, you can halve the recipe for the marinara.